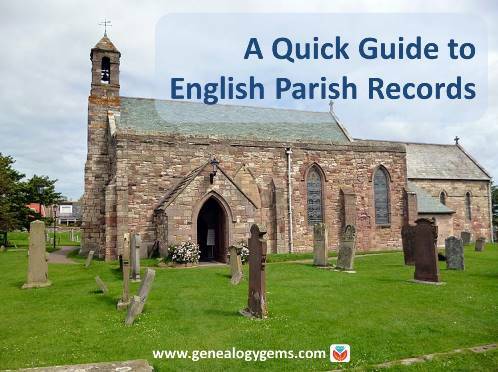 English Parish records are a rich genealogical resource. England’s earliest useful census is from 1841, and civil records only go back to 1837. Let us help you trace your English family history before that time. English parish records might hold the key, and we’ve got all the information you need to get started searching them. 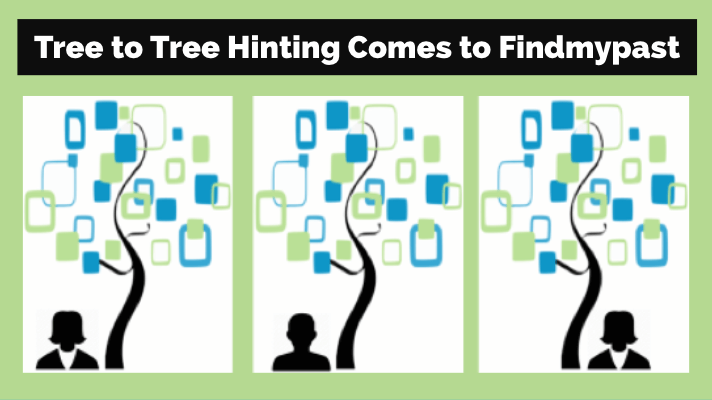 This post is the second in a series on finding your English ancestors by Kate Eakman of Legacy Tree Genealogists. Click here for the first installment on the difference between “Great Britain,” United Kingdom,” and “England;” census records and civil birth, marriage, and death records available through the General Register Office, or GRO. Census and civil records are extremely useful and important for genealogical research in England. But the earliest useful census is from 1841, while the civil records only extend back to 1837. So what do researchers do to trace their English ancestors back to earlier times? How can you find your family if they emigrated in the 1700s or even earlier? Genealogists owe a debt of thanks to King Henry VIII’s chief advisor, Thomas Cromwell. After England’s split from the Roman Catholic Church, Cromwell issued an injunction in September of 1538 requiring every church in England to maintain a register of baptisms, marriages, and burials. The law was followed with varying degrees of consistency until Queen Elizabeth I, and the bishops of the Church of England reaffirmed the injunction in 1597. Wars, insects, water, and carelessness have led to the loss and destruction of many of these parish records, but there are still thousands of registers listing these important events available for our use today. There are some Catholic Church records available for the years prior to 1538, but in general, the bulk of the ecclesiastical records begin with the Church of England or Anglican Church records starting in the mid- to late-1500s and extending into the late 1800s. So what are you looking for, where do you find them, and what do those records provide? To explain that, we need to review how the church, whether Roman Catholic or Church of England, divided up the country. At the lowest level, we have parishes. The size of a parish can vary, and not every town or village had a parish church. Some parishes include a chapelry or two (small local churches or chapels which were under the jurisdiction of the parish priest). Within the records of the parish church is the most likely place for you to find information about your ancestors. Parishes were then grouped together under the jurisdiction of a bishop who was in charge of a diocese. There could be archdeaconries or rural deaneries within a diocese as well. Don’t overlook a record set for the archdeaconry or the rural deanery with the name of your ancestor’s town (Archdeaconry of Richmond or the Deanery of St. John). You will also see bishop’s transcripts which are just what it sounds like: copies of the parish records which were sent to the bishop of the diocese. These were generally made annually, and were required beginning in 1598, with most extending to the mid-1800s. Bishop’s transcripts were supposed to be exact copies of the parish records, but they may contain either less information (the local parish priest abbreviated the registers) or more information because the local minister had the luxury of time when recopying the registers and so added details not found in the original parish registers. Of course, there is always the possibility of error creeping in, as is true any time that someone is recopying text from one page to the next. It is wise to consult the bishop’s transcripts as well as the parish registers when they are both available so that you are certain that you have every detail available. Finally, the parish church was not always the closest church to a family’s home. A baptism, marriage, or burial could have taken place in a neighboring parish. If you are unable to find the parish records where you expect to find them, use a map to search for neighboring parishes and try searching for your ancestors there. It is not uncommon to find that several children from a family were baptized in one church and the others were baptized in a different church, so look around and keep in mind what is a reasonable walking distance for parents with a baby, a bride and groom, or to carry a dead man’s body for burial. Look for places less than three miles from the home of your ancestors. 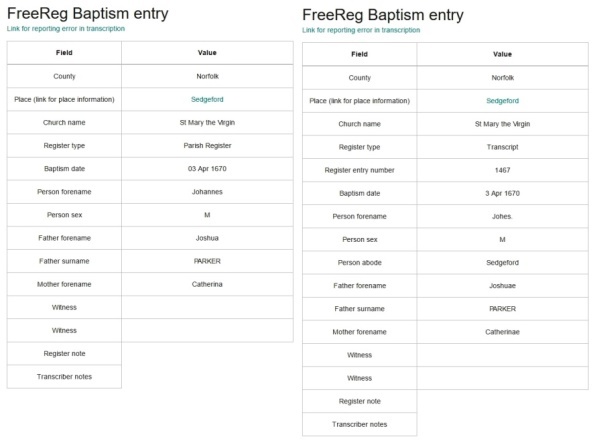 The same folks who provide us with a free index to civil birth, marriage, and death records also have provided transcripts of ecclesiastical baptismal, marriage, and burial records at FreeReg. Here you can enter the name, a range of dates, the county, and select the type of records. 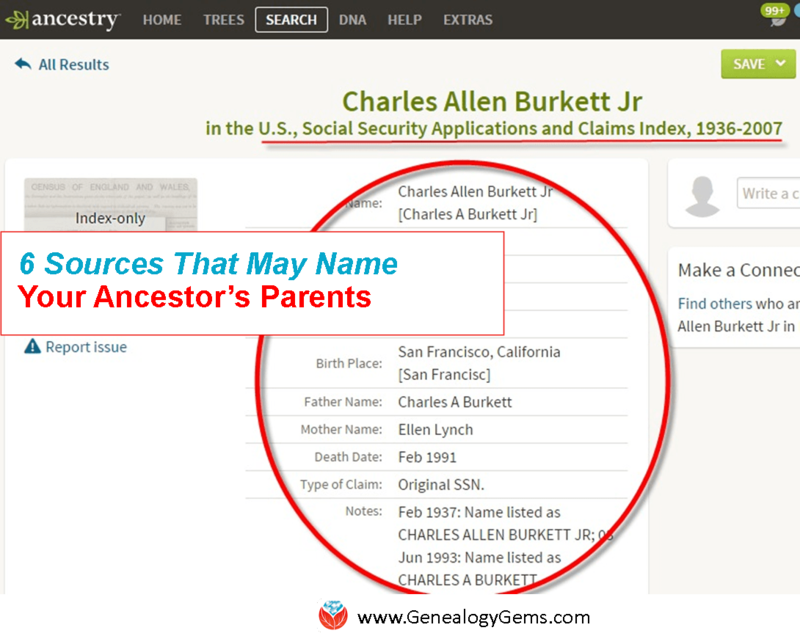 Be sure to click on the “Name Soundex” box in case your ancestor’s name was spelled slightly differently than the modern version. Although these are transcripts with no links to the actual records, this site can help you to narrow down a broad range of choices to the one most likely to belong to your relative. Baptismal entries generally include the date of the baptism, the place of the baptism (including the church name), and the names of the parents of the child. The mother’s maiden name is almost never included unless the child was illegitimate. It is also important to remember that baptisms could occur anywhere from the day of birth up to three or more years after the child’s birth. Unless the record specifies the date of birth, assume that it occurred up to three years earlier when continuing your research. Transcripts of parish register on the left and bishop’s transcript on the right for the same person, John Parker. Due to the use of Latin and the different sentence construction, the names appear to be slightly different, but both are translated as John Parker, son of Joshua and Catherine Parker. Images courtesy https://freereg.org.uk. Marriage records will include the date and location of the marriage, which was usually the parish church of the bride. Both the bride and the groom will be named, but it is rare to find any additional information such as the occupation of the groom or the names of their parents. 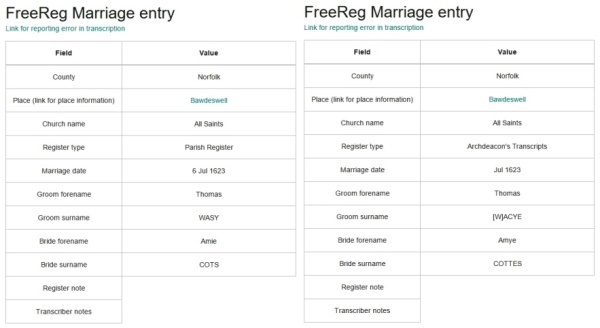 The examples of a parish register and the archdeacon’s transcripts provide variant spellings of the groom’s surname: Wasy and Acye or Wacye. The bride’s given and surnames have different spellings as well: Amie and Amye and Cots or Cottes. This is why we encourage researchers to use the “Name Soundex” box, particularly since these records are for the man known as Thomas Wise today. Note the different spellings of the names although the archdeacon’s transcript was supposedly a copy of the parish register. Images courtesy https://freereg.org.uk. Burial records, which are not the same as death records, provide the name of the deceased, the date and place of his or her burial, and the names of the parents. If the deceased was married, the name of the husband or wife is also included. Most burials occurred between one and three days of death, but unless the record specifies a specific date of death, it is best not to assume a particular day. The burial record below is an excellent example of additional information which can be included on a bishop’s transcript. 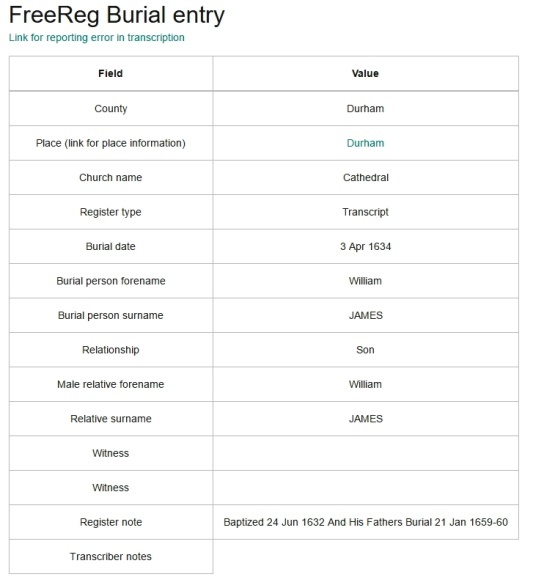 The parish records no longer exist for burials from the cathedral church of Durham, but the bishop’s transcript provides very useful additional details. From this record, we learned that William James, who was buried on 3 April 1634, was baptized on 24 June 1632. His father, also named William James, was buried 21 January 1659/60. The split date for the burial of William James, Sr. (21 January 1659/60) indicates the date differences of the Julian and Gregorian calendars. This type of annotation can be seen during the first three months of each year in English records until 1751 when England officially accepted the Gregorian calendar. Image courtesy https://freereg.org.uk. Click here to learn more about Julian and Gregorian calendars. There are also a number of Online Parish Clerks (OPC) websites which allow you to search for transcriptions. Lancashire’s OPC site is one of the most complete sites and is easy to use. If you are fortunate enough to have ancestors from Lancashire, definitely use this site. For other OPC sites, go to UKBMD.org for links to about 20 other projects. 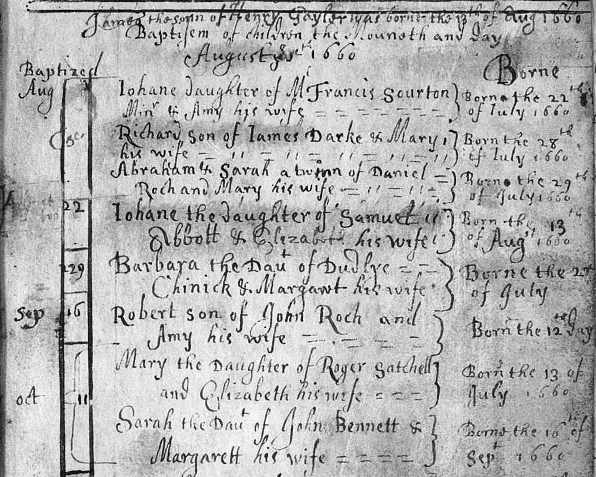 Once the transcripts of your English ancestor’s baptisms, marriages, and burials have been located, you can turn to several sources to locate the actual copies of the records. There are some digital copies available on FamilySearch.org. (Note that the agreement that the Family History Library has with a number of the repositories requires that you access the records from a local LDS Family History Center and not from your home.) You can also find copies of the documents on the for-fee site FindMyPast.com (and click here for English Catholic parish records at Findmypast.com). Devon Parish Registers showing 1660 baptisms from http://findmypast.com. Parish registers and bishop’s transcripts are very useful for tracing English ancestors back to the mid-1500s. The registers include baptismal, marriage, and burial records and although they often contain only the bare minimum of information, that can be used to research and extend your family tree. Because everyone in the parish was included–not just the wealthy and powerful–these records can allow us to trace our English ancestors for many generations.